Native Range: St. Lawrence-Great Lakes, Arctic, and Mississippi River basins from Quebec to Northwest Territories, and south to Alabama and Arkansas (Page and Burr 1991). Table 1. States with nonindigenous occurrences, the earliest and latest observations in each state, and the tally and names of HUCs with observations†. Names and dates are hyperlinked to their relevant specimen records. The list of references for all nonindigenous occurrences of Sander vitreus are found here. Means of Introduction: Intentionally stocked as a food fish and for sportfishing. One of the earliest introductions occurred in 1874 when Livingston Stone gathered a small number of adult Walleye captured in Vermont and transported them to California where the fish were released into the Sacramento River (Smith 1896). According to Dill and Cordone (1997), in the 1890s the California Fish Commission applied to the U.S. Fish Commission for shipments of Walleye for use in controlling carp in Clear and Blue lakes; however, no Walleye were imported at the time. These same authors also noted that the state received Walleye eggs from Minnesota in 1959 and that these fish were to be used to control bluegill and support other sport fish in southern California reservoirs. In Idaho, Walleye may have been stocked accidentally with yellow perch Perca flavescens (Linder 1963). McMahon and Bennett (1996) state the first introduction into southern Idaho reservoirs was in 1974. The person or agency responsible for introducing the species into Washington is uncertain. The federal government may have introduced them in the early 1960s (Dentler 1993). A sport fishery had developed in Lake Roosevelt, Washington, by the 1960s (McMahon and Bennett 1996). Walleye was first reported in Wyoming in 1961 from Seminoe Reservoir in the upper North Platte River. The fish were swept downstream and are now established in a 450-km stretch of river (McMahon and Bennett 1996). Herke (1969) performed experimental stocking into private ponds to examine the survivability of this species in peninsular Florida. The Walleye was stocked illegally in Canyon Ferry Reservoir, Montana, and was found first circa 1991 (White, personal communication). More recently, the species also was illegally stocked in Noxon Reservoir on the Clark Fork of the Columbia River, Montana (McMahon and Bennett 1996). Illegal introductions seem to be a growing problem in western states (McMahon and Bennett 1996). Status: Many states have had some success in establishing reproducing populations. Other states have maintained populations with annual stocking. Occurrences in Delaware are due to strays from Pennsylvania stockings (Raasch, personal communication). Extirpated in California (Hubbs et al. 1979; Dill and Cordone 1997). Dentler (1993) indicated that Walleye populations were spreading throughout the Columbia River basin. Walleye abundance in the Clark Fork and Pend Oreille rivers, and Lake Pend Oreille, doubled between 2011 and 2014 (Anonymous 2014). Impact of Introduction: McMahon and Bennett (1996) recently reviewed the literature and presented a summary of impacts of Walleye in the Northwest. Overall, the effects of its introduction were considered complex and varied. The Walleye has been shown to prey on smolts of Pacific salmon, and therefore pose a threat to these already declining species in the Columbia River (Dentler 1993; McMahon and Bennett 1996). For instance, it is estimated that Walleye consume two million smolts annually in the Columbia River, about one third of total predation loss (McMahon and Bennett 1996). A study in Seminoe Reservoir, Wyoming, found Walleye stocking to result in a sharp decline in native minnows Hybognathus spp., darters Etheostoma spp., suckers Catostomus spp., rainbow trout Oncorhynchus mykiss, and crayfish Orconectes obscurus. For instance, most of the 500,000 trout fingerlings stocked annually were eaten within a few weeks. Consequently, there was a need to stock larger rainbow trout to avoid predation, an action that increased hatchery operation costs (McMahon and Bennett 1996). In their native eastern habitat, Walleye and salmonids are able to limit interaction by living at different water temperatures (depths) and in different habitats (McLean and Magnuson 1977). However, in western reservoirs the lack of a strong thermocline and a small littoral area does not permit this separation (McMahon and Bennett 1996). Numbers and health of brown trout Salmo trutta were found to decrease after introduced Walleyes consumed a large portion of the crayfish population, the brown trout's favorite food (McMahon and Bennett 1996). When the Walleye initially was introduced into Salmon Falls Creek Reservoir, Idaho, yellow perch Perca flavescens comprised 80% of the sport fish. 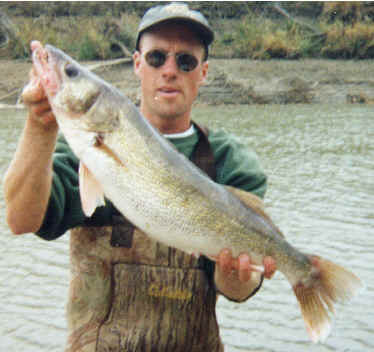 However, 12 years later, Walleye made up 80% and perch only 1% of the fish in the reservoir (McMahon and Bennett 1996). Similar perch collapses also have happened at two other reservoirs in Wyoming (McMahon and Bennett 1996). A crash in the yellow perch population in Canyon Ferry Reservoir may be related to past Walleye introduction; studies are being conducted to look at the problem; in addition, it has been predicted that Walleye will have a large impact on the trout fishery in the reservoir (White, personal communication). In many cases introduced Walleye deplete the forage base. As a consequence, the surviving Walleye population consists of stunted individuals and the species no longer serves as a valuable fishery (McMahon and Bennett 1996). Some states now prohibit the introduction of Walleye into certain waters. For instance, Walleye introductions are banned in the Snake River drainage in Idaho because of concern about predation on anadromous salmonids (McMahon and Bennett 1996). Further introductions in Oregon also are forbidden due to concern about predation on salmonid smolts in the Columbia River (McMahon and Bennett 1996). Although 40 million Walleye are stocked annually to maintain an important sport fishery in eastern Montana, the species has been banned from waters west of the Continental Divide in that state due to concern for important native and nonindigenous salmonid stocks (McMahon and Bennett 1996). Remarks: The Walleye is a desirable sport and food fish. Although the species was thought to be native to a few drainages flowing into the Atlantic, Jenkins and Burkhead (1994) reviewed and evaluated the literature on the distribution of eastern populations and concluded that the populations on the Atlantic slope south of the St. Lawrence probably are introduced. As with many of the Virginia species, Jenkins and Burkhead provided extensive detail on the introduction history of Walleye in waters of Virginia and surrounding states. McMahon and Bennett (1996) provided a map and a table of Walleye introductions in the northwest. The species' distribution in Alabama south of the Tennessee drainage was discussed by Brown (1962), who speculated that they are native to that region. Lee et al. (1980 et seq.) reported them as introduced. Billington and Maceina (1997) investigated the genetic status of Walleyes in Alabama, where the southern Walleyes are native but northern Walleyes from Ohio and Pennsylvania have been stocked. They concluded that transplanted female northern Walleyes did not survive to reproduce. However, because of the type of analysis done (mtDNA) they could not tell if any of the transplanted males survived. One especially problematic record comes from the Escambia drainage in Alabama (Brown 1962; Mettee et al. 1996). Only a single individual has ever been collected from the drainage. None have been taken downstream in the Florida portion of the drainage. Swift et al. (1986) reported it as introduced into the drainage. In discussions with Gilbert (personal communication), he believes the species was introduced to the Escambia based on the fact that only one specimen has been collected, the apparent lack of suitable habitat, and the fact that this sport-fish is more likely to be introduced than less desirable species. He also pointed out that Bailey et al. (1954) failed to include this species in their paper on the Escambia and that Mettee et al. (1996) did not find it in their survey work. He also believes that if the Walleye were native to the Escambia, it would be present in the lowermost (Florida) section because that is the stretch with the most suitable habitat. He likens the Walleye to Crystallaria asprella, which is found only in the lower section of the drainage (Gilbert 1992). However, JDW (author) believes it is native to the drainage because of the presence of several other native large-river fish and mussel species; the collection was before the state began stocking this species, the drainage has never been extensively sampled, and some sections do contain suitable habitat. Much habitat was lost when two dams were constructed on the river in the 1940s. Many large-river mussels suffered from these impoundments (JDW, personal observation) and Walleye could have done the same. Although Walleye have been introduced widely into the region, Starnes et al. (2011) discuss zooarcheological evidence suggesting that this species may actually be native to some mid-Atlantic Slope drainages (south to Albemarle Sound and Chesapeake Bay, including the Potomac River). Anonymous. 1994. Fish Stocking Report. Texas Parks & Wildlife News. February 25, 1994. 18 pp. Anonymous. 2001. Oregon's Warm Water Fishing with Public Access. http://www.dfw.state.or.us/warm_water_fishing/index.asp. Anonymous. 2014. Non-native walleye numbers double in Clark Fork Delta in three years, elimination not possible. The Columbia Basin Bulletin. Bend, OR. http://www.cbbulletin.com/432721.aspx. Created on 12/05/2014. Accessed on 01/08/2015. Brown, B. E. 1962. Occurrence of the Walleye, Stizostedion vitreum, in Alabama South of the Tennessee Valley. Copeia, 2: 469-471. DeLorme. 1992a. Idaho Atlas and Gazatteer.DeLorme, Freeport, ME. 63 pp. DeLorme. 1992b. Washington Atlas & Gazatteer. DeLorme, Yarmouth, ME. DeLorme. 1992c. Wyoming Atlas and Gazatteer. DeLorme, Freeport, ME. 72 pp. DeLorme. 1993. Maryland and Delaware Atlas and Gazatteer. DeLorme, Freeport, ME. 80 pp. DeLorme. 1995. Virginia Atlas and Gazatteer. DeLorme, Yamouth, ME. DeLorme. 1996a. Arizona Atlas and Gazetteer. DeLorme, Freeport, Maine. 76 pp. DeLorme. 1996b. Nevada Atlas and Gazetteer. DeLorme, Freeport, Maine. 72 pp. DeLorme. 1996c. Vermont Atlas & Gazatteer. DeLorme, Yarmouth, ME. DeLorme. 1997. Colorado Atlas and Gazatteer. DeLorme, Yarmouth, ME. 102 pp. DeLorme. 1998a. Georgia Atlas & Gazatteer. DeLorme, Yarmouth, ME. DeLorme. 1998b. New Mexico Atlas and Gazatteer. DeLorme, Yarmouth, ME. DeLorme. 1998c. Utah Atlas and Gazetteer. DeLorme, Freeport, Maine. 64 pp. DeLorme. 1999. Connecticut/Rhode Island Atlas & Gazatteer. DeLorme, Yarmouth, ME. Herke, H.W. 1969. Florida Walleye? Proceedings of the Annual Conference of the Southeastern Association of Fish and Wildlife Agencies 23:648-650. Holton, G.D. 1990. A Field Guide to Montana Fishes. Montana Department of Fish, Wildlife and Parks. Helena, MT. 104 pp. Lee, D.S., C.R. Gilbert, C.H. Hocutt, R.E. Jenkins, D.E. McAllister, and J.R. Stauffer, Jr. 1980. Atlas of North American Freshwater Fishes. North Carolina State Museum of Natural History, Raleigh. 12: 1-854. Loyacano, H. A. Jr. 1975. A List of the Freshwater Fishes of South Carolina. Bulletin of the South Carolina Experimental Station. Bulletin 580, 9 pp. Madison, D. 2003. Outlaw Introductions. Montana Outdoors. July/August 2003: 26-35. McLean, J., and J.J. Magnuson. 1977. Species interactions in percid communities. Journal ofthe Fisheries Research Board of Canada 34:1941-1951. McMahon, T.E., and D.H. Bennett. 1996. Walleye and northern pike: boost or bane to northwest fisheries? Fisheries 21(8):6-13. Nico, L.G. 2005. Changes in the fish fauna of the Kissimmee River Basin, peninsular Florida: nonnative additions. Pages 523-556 in Rinne, J.N., R.M. Hughes, and B. Calamusso, eds. Historical changes in large river fish assemblages of the Americas. American Fisheries Society Symposium 45. American Fisheries Society. Bethesda, MD.